He sent forth also a dove after him, to see if the waters had now ceased upon the face of the earth. But she, not finding where her foot might rest, returned to him into the ark: for the waters were upon the whole earth: and he put forth his hand, and caught her, and brought her into the ark. And having waited yet seven other days, he again sent forth the dove out of the ark. And she came to him in the evening, carrying a bough of an olive tree, with green leaves, in her mouth. Noe therefore understood that the waters were ceased upon the earth. And he stayed yet other seven days: and he sent forth the dove, which returned not any more unto him. The earth covered in waters represents a world drowned in narrow materialism, sin and self-regard. From the moment of her Immaculate Conception our Lady became a pilgrim: in this world but not of it. Noah and his family in the Ark stand for the anawim the humble righteous ones looking with hope for the coming kingdom which would dry up the waters and flood the world instead with the spirit of love and devotion. 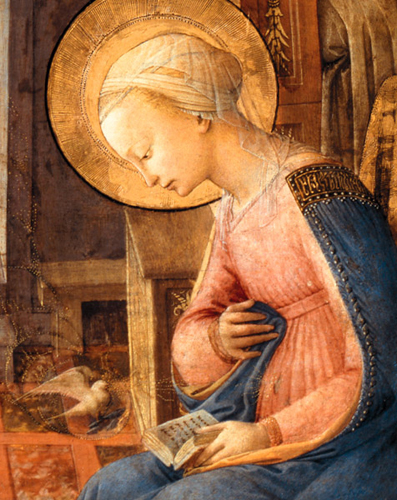 Mary became in a special way the representative and ambassador of the anawim. She flew forth across the waters filled with love and hope but could find nowhere where here foot might rest. She was sustained only by the wings of faith and the winds of the spirit. 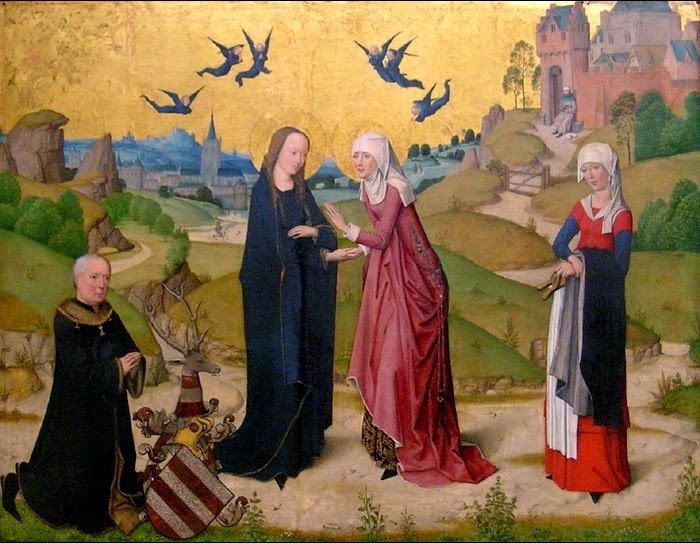 Finally she came to rest in the hands of St Ann, her mother, and St Joseph, her betrothed. The receding of the waters is a symbol for the completion of the redemptive work of Jesus, sin and death have been finally conquered. The dove resting in the Ark among the family of Noah represents Mary after the days of the Passion, Ascension and Pentecost resting in the family of the Church. And after she completes her full time on earth (in the scriptures the number seven is a signifier for completeness) she flies one more time, raised by the angels to be reunited once more and forever with her Risen and Glorified Son. We are more fortunate than Noah, however, for if the dove never returned the Virgin certainly has many times. Because of the victory won by her Divine Son she now has numerous places upon which she can rest her foot, above all in the presence of the Christian anawim the St Bernadette's the St Juan Diego's the humble poor to whom she delights to appear at Lourdes in France, at Tepeyac in Mexico, at Fatima in Portugal and in numerous places. Always she carries with her the olive bough with the green leaves reminding us of her Son, of His Passion and Resurrection of the hope that He brings to the world and of the need for us to turn to Him with repentance and love. "What's in it for me?" is a perfectly reasonable question to ask whenever someone tries to persuade you to take a risk. It may not be the only or even the most important question but it is certainly one which can legitimately be put. One cannot, therefore, blame non-Christians for taking it into consideration when hearing the appeals of evangelisers to be 'born again in Christ Jesus.' To people who believe in neither heaven nor hell the promise of the one and the threat of the other will make no impression. Likewise those who have no sense of sin are conscious of no burden of guilt from which they have to escape. None of these things then can be advanced as being relevant to the "what's in it for me?" criteria. The idea that the population would be susceptible to such appeals is the heritage of a time which has now past. Where you have a society in which almost everyone accepts the basic ideas of Christianity the task is to energise them, to get them to move from theory to practice. In the West today there are few if any such societies so the strategy requires to be revised. Fortunately the Church has experience in dealing with a world in which most people were ignorant of, indifferent to or antagonistic about basic Christian doctrines. This was the gentile world of the first century Mediterranean where the Apostles and their associates did the work of planting the Catholic Church in the first place. I think that they made three distinct promises which each convert would receive as a gift when becoming converted to the faith, promises which the Church can still make and which provide the answer "this is what is in it for you." The second promise is Christ Himself. Him you will certainly receive. By this I mean the whole Christ not the attenuated wise teacher of so many timid sermons or relativist theologies. The full red-blooded Son of God and Son of Mary, crucified on Calvary, risen from the dead, ascended to the Father. Many people have a vague idea about Jesus, He is a sort of blank space of vacuous goodness upon which can be written or projected whatever a person wants to impose upon Him. He is cited in defence of this political project or that abnormal form of conduct. A Christian receives Him in all His dimensions, present in the Gospels and all Scripture, made present in His body the Church, seen suffering in the world among the vulnerable and outcast, encountered under the appearance of bread and wine in the Eucharist. And then there are miracles. Many Christians get a bit shifty when it comes to miracles explaining that biblical accounts are either metaphors or psychological cures for psychosomatic ailments. There are healing ministries in places but these are out of the mainstream and all too often tainted with charlatanism. Yet the scriptures couldn't be clearer "Now many signs and wonders were done among the people through the apostles" (Acts 5:12.) The early Church was acquainted with the miraculous and that was part of the package that believers signed up to. Nowadays educated opinion frowns on the idea so the Church often appears apologetic about it or hushes it up altogether. This approach is nonsense, if Christians believe that Jesus rose from the dead why should they disbelieve in varicose veins being healed? Moreover impressing the intellectual elite is not the sole purpose of the Church, millions of people do not have an a priori belief that miracles cannot happen therefore they do not happen and to close off from them this part of the Good News because we are afraid of appearing foolish in front of the worldly wise is a dereliction of duty.
" Time after time I have been told at Lourdes—by doctors, nurses, brancardiers, even by the man who sweeps the paths: "The sick? Oh, Madame, they've forgotten about their own cure. All they care about is that the man in the next row shall get well. . . . 'Don't bother about me—that fellow over there needs you more.' . . . 'Never mind, nurse, I can wait.' . . . 'Look after this poor lady in the next carriage—she really needs attention'." Naturally the pain comes back again, but it hasn't the same hold. Their minds are not centred on it any longer. And when the time comes to go home, though they haven't been physically cured, though they know what hardships and suffering yet another pilgrimage will mean, their one cry is: "If only I can come back next year! If only I can come again to Lourdes!" So, "what's in it for me?" You get the Holy Spirit, Jesus and miracles. The proof of all this is experimental, that is these are gifts that you can only have by having not by being told about. The invitation to be born again is a risk, there is so much that you have to give up, to leave behind. But there is also so much to gain. The choice is yours to make. My other blog is thoughtfully detached. 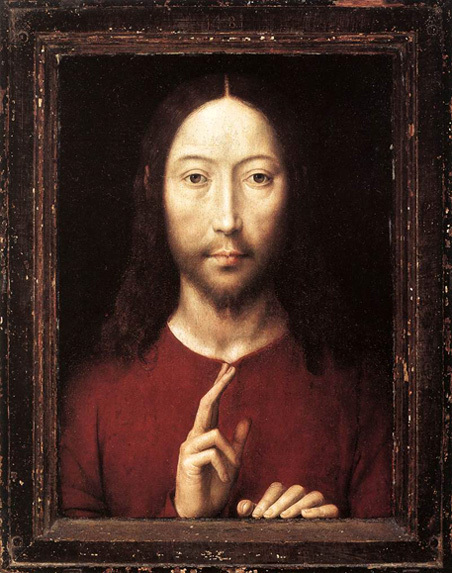 Did Jesus Teach a Secret Gnostic Doctrine? Since ancient times there have been those who say that Jesus taught one doctrine openly and another, higher, one secretly to those initiated into His circle.From time to time groups have emerged, and still emerge, which claim to be custodians of this doctrine or to have 'rediscovered' it. A claim which, of course, it is impossible to either verify or to disprove. A somewhat related theory suggests that during His youth our Lord went to India and upon His return taught some form of Buddhism or Vedanta Hinduism to those followers whom He had first drawn to Him by preaching a radical form of Judaism. To some extent these are all conspiracy theories; a way of viewing the world which is notoriously difficult to unsettle. Anyone who wishes to believe such a theory, whatever form it may take, is meeting a psychological need and is likely to be impervious to those facts which fail to meet that need. Nonetheless I think that it is a worthwhile exercise to demonstrate why I think these are untenable approaches for explaining the mission of Jesus. 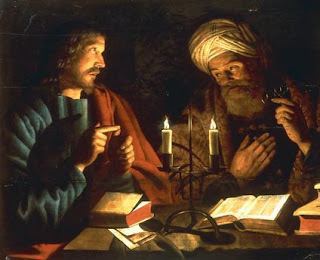 It is certainly true that there are a number of texts which show our Lord unfolding His teaching in a veiled way (the parables) before huge crowds and in a more explicit way (the discourses) before His disciples. What they don't show is that there is any difference in content between the parables and the discourses, the latter explain the former they don't alter their meaning. Moreover the category of 'disciples' is not clearly defined. The Apostles were a group of 12 who accompanied Jesus but the disciples were simply those who were attracted to Him by His teachings and works. We cannot then assume that wherever Jesus went the disciples who listened to Him were a fixed group of people. In all probability those who joined the Apostles to hear the explanations of the parables were people who had been in the crowd and who desiring to learn more had come forward to ask questions. To believe in an esoteric doctrine we need to suppose that Jesus spoke in parables to the crowds then more clearly in His discourses to the disciples and then more clearly still to an inner circle of initiates including the Apostles and Mary Magdalene. And there simply is no warrant in the texts to assume that this third stage happened. Another point to note is that there are texts in which our Lord quite clearly suggests that He is not preaching a secret doctrine. In Mark 4, for example, we have- 'He said to them, “Is a lamp brought in to be placed under a bushel basket or under a bed, and not to be placed on a lampstand? For there is nothing hidden except to be made visible; nothing is secret except to come to light.' (Mark 4:22) And before the Jewish High Priest He said- “I have spoken publicly to the world. I have always taught in a synagogue or in the temple area where all the Jews gather, and in secret I have said nothing. Why ask me? Ask those who heard me what I said to them. They know what I said." (John 18:20-21) So either Jesus was lying, in which case He has not a spiritual leader worth following, or He was telling the truth in which case there is no esoteric doctrine of the Christ only the public one. History suggests that all but one of the Apostles met a violent death, martyred for the sake of the public doctrines of the Christian Church. 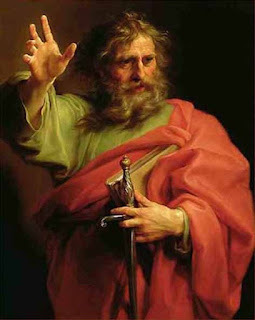 There are some who dispute this but the Gospel certainly points to Peter's martyrdom (John 21:19) and Paul's willingness to be martyred (Acts 20:22-24.) There is no doubt either that many Bishops and others one can assume to be in the inner core of the Church willingly suffered torture and death for the openly professed doctrines of the Church. Now, why would they do that if they held those particular doctrines to be of little importance besides the esoteric ones which they secretly believed? One answer would be that the secret teachings were equally liable to persecution by the Roman authorities. The problem with that is that the various Gnostic groups and sects who claim to hold and teach the esoteric doctrines of Jesus Christ do not, in fact, advance anything that the Romans would have found half so objectionable as they thought Apostolic Christianity to be. If Jesus is the unique Incarnation of the Son of God whose crucifixion and death redeems those who acknowledge Him to be Lord and Saviour then Christians are obliged to refuse worship to anyone else. This is the thing which most annoyed the authorities of the day and led to the persecution of the new movement. However, the Gnostics tend to claim that Jesus is simply, like the Buddha, the one who has most fully attained the life of the Spirit. What He offers is not Himself as such but His teachings. That being so there is no compelling reason to allow yourself to be killed for asserting His unique divinity when you believe that anyone can become equally divine by accepting His teachings and living them to the full. If you think that an esoteric doctrine exists then it requires you to suppose that it was held and taught not by the Apostles but by some other group who constituted an inner circle separate from the only inner circle for which we have any textual evidence. There is an equal but opposite argument advanced by some Protestant Evangelicals that the Catholic Church dwells too much on what it calls 'mysteries,' especially regarding the Sacrifice of the Mass.It is said that the Church is pretending that the clear and simple message of Jesus has some hidden meaning that only priests can penetrate on behalf of the faithful. This is to misunderstand the meaning of the word 'mystery.' It signifies that there are things beyond the power of the human mind to understand fully. It does not signify that there are things which are fully known but deliberately hidden. It is, for example, impossible to fully unpack a sentence like ' I am the living bread that came down from heaven; whoever eats this bread will live forever; and the bread that I will give is my flesh for the life of the world' (John 6:51) without coming up to the boundaries of the knowable. In that sense Christianity is and always will be a mysterious religion. What it isn't and never has been is a two-speed religion with the fullness of revelation reserved for initiates and some second-rate hand-me-down reserved for a gullible public. The Christ of the Church is the Christ for all. Missionary religions have the task of persuading people to totally transform their lives. In pursuit of this objective there is a temptation to over-egg the pudding. The old life is painted in vivid language as being one of unrelieved misery totally immersed in wicked sin. By way of contrast the new life of the convert is portrayed in glowing terms full of happiness, joy and general goodness. Unless the person being evangelised is in a particularly vulnerable emotional state or has the wisdom to see a core truth concealed within the apparent hyperbole they will not be convinced. They will seldom think of their own lives in such bleak terms or of themselves as being such moral reprobates. If, moreover, they know many religious believers they will but rarely observe them to be significantly more happy or more virtuous than their unbelieving neighbours. A fiery Christian preacher might argue that what they are saying constitutes an objective truth and that only a false consciousness (to borrow an expression from Marxism) prevents their unredeemed listeners from accepting it. This may be so but a personally experienced subjective reality has more power to convince than the truest of objective truths not directly felt. Most lives, I suspect are lived in a neutral zone, islands of misery or of happiness occasionally loom out of the fog and then are more or less swiftly left behind. In this context I think that the paired opposites offered by St Paul to the Ephesians constitute a more effective evangelical tool. They are also slightly surprising, wakefulness and sleep we might expect but death and light rather less so. Within Buddhism and Vedanta Hinduism the notion that the unrealised or unenlightened person is inhabiting a word of illusion (Maya) out of which they can escape only when they grasp the essence of the Real is a commonplace. It cannot be understood in the same sense within Christianity because not only is the material universe real it has also in a sense become divinized through the Incarnation and will be a part of eternity in the physical resurrection of believers. We can however say that perceiving the material cosmos to be the only reality is an illusion and that a life premised on that perception has a dream like quality by comparison with one based on the dual truths of the physical and spiritual realms. Therefore the missionary should be nudging her audience to consider the question 'Is this it?' when they consider their personal lives and the collective life of the society and the world which they inhabit. This does not need them to presuppose their own misery and wickedness but simply to acknowledge the divine discontent which their hearts will, at least from time to time, experience when they live as if the answer to the question is 'Yes.' To begin, even if hesitantly, to answer 'No' and to live in accordance with that answer is to wake the spiritual self from that slumber into which materialism has put it. The notion that we are dead though apparently alive is parallel to that of being asleep though apparently awake. Where 'Christ will give you light' differs from 'Awake' is that it introduces the idea of personal relationship. It is not simply that we realise a truth, spiritual life is a reality, but that we encounter that truth in the form of a person. The light is given to us personally by Him personally. Nor is it a simple transaction, it is a process, He does not give us a fixed amount of light and then go about His business. It is always in the future tense He 'will give' light. The more alive we become the more light He shall give us, the more light He gives us the more alive we shall become. So here the threefold task of the missionary is to relate the divine discontent of her listeners to their perception of the reality of a spiritual realm to the person of Jesus Christ. The necessity for conversion is great but one strategy for overcoming the false consciousness or false sense of security of the unbeliever is not confrontation or condemnation but a leading of them to a personal encounter with our Lord. It is also worth bearing in mind the second reason for the failure to convince which I mentioned earlier. Christians are not noticeably happier or more virtuous than their neighbours. Leaving aside the question of Christians-in-name-only I would argue that there is no particular reason to expect that the outward aspect of believers will be markedly different from that of non-believers, in most cases they are at best 'work in progress.' It is the inward aspect that should be forever altered. The islands of misery and happiness are still encountered (although in a transformed way) but the neutral zone should be a thing of the past. No day spent in the company of Jesus, no hour spent with the Holy Spirit, no time spent in the hand of the Father is neutral time. The light which is shed upon the Christian life and within the Christian heart makes all time kairos- the right moment.